How do you empower a community to care for each family’s health when the odds are stacked against them? This is a question that we think about every day in our jobs as peer specialists at the Native American Health Center in Oakland, California. 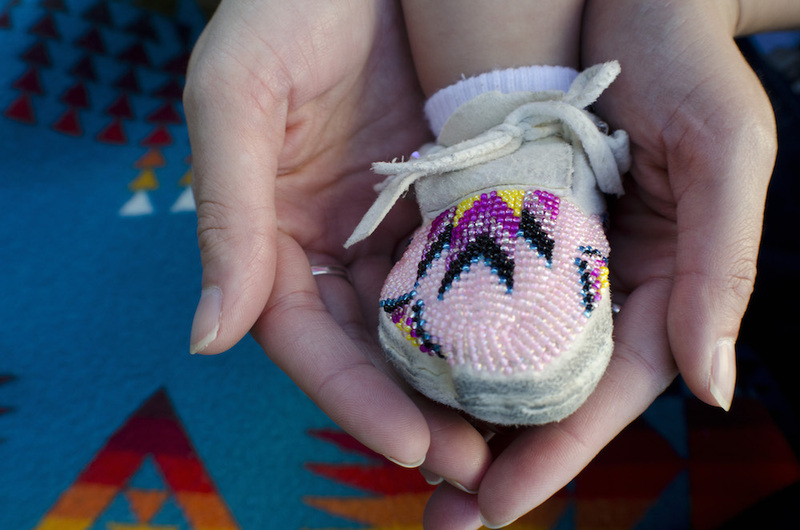 According to the Alameda County Public Health Department, over 500 Native American babies are born in our county each year. With our colleagues at the Strong Families Tribal Home Visiting Project, we have worked with more than 50 of these children in the past two years, meeting with them weekly or biweekly from pregnancy through age three. We support families by connecting them to the services they need, while also providing tools for nourishing community and family health, teaching life skills, and developing parenting knowledge and engagement. We are part of the extended family for urban Native Americans in this county. Oakland today reflects an important part of Native American history. In 1953, Congress passed HRC 108, which aimed to shut down rural reservations and relocated more than 100,000 Native people to designated cities. Due to this relocation, 70 percent of us now live in cities, including those in the Bay Area. Moving from as far away as Oklahoma, families got very little support for the actual re-making of their lives when they were placed in government housing in the Bay Area. They were deliberately separated from each other in an attempt to hasten their integration. Uprooted families struggled with lack of support, invisibility, discrimination, and separation from their communities and culture. But in the early 1960s, a new, politically conscious “Urban Rez” began to take shape as Native American leaders created community in Oakland and San Francisco. These leaders founded the Native American Health Center, where we work, as well other resource centers and friendship associations that provided everything from Wednesday night community dinners—where people could form new bonds—to health care. Years later, our community still needs special care: Community members face all the issues of living in East Oakland while support networks are stretched to the breaking point between multiple cities and rural areas. Our program aims to meet the whole family where they are at: Some need information, some need services, and others need more. If they need food or housing, we help with that. If they need help advocating for themselves for housing, in court, at school, or with health care, we take them and help them learn the system. We’ve come to understand that it doesn’t make sense to teach a lesson on potty training if the water or lights are shut off. We help with what they need first. Sometimes things go really well. A home visit that Paty did recently went like this: The family’s 11-month-old baby was walking for the first time. She was doing that funny stumble they do; it was amazing. The family has stable housing and food right now. Their six-year-old daughter was home from school. And so was the dad. And Paty got to see all of them interacting with one another. The daughter said, “I want to exercise and you should, too, Dad,” which showed Paty that the whole family is engaged in thinking about their health. So she did a lesson on hand-eye coordination and also on setting boundaries. To Paty, that was a successful visit: Everybody in the family was participating. No one was stressed, upset, or uncomfortable. This is a textbook case of what our visits are supposed to be like. Our “textbook” is a curriculum called Family Spirit, which teaches health education, life skills, child development, and parenting skills through home visits, which was developed by rural Apache and Navajo tribes in partnership with Johns Hopkins University. But we’ve found we’ve had to stray from the textbook, too. Our families come from 200 different tribes—not just two—and in Oakland, our families struggle to navigate the overburdened, often dysfunctional service system. For urban Native Americans, we’ve had to take the broader view that community is extended family. We’ve also had to go well beyond routine home visits. For example, Cara had only known a mom for a few months when the mother went into labor. Normally, the new mom would have support from family members. But this mother was on her own, so Cara kept her company the morning she had to go in to be prepped for her C-section, drove her to the hospital, and waited with her until it was time for the procedure. This broke down a wall between them. When someone’s vulnerable and has no one to walk with them in heavy situations, our job is to be there for them. We see it as a way to build trust with them and their child. This mother was able to open up to Cara about what she needed. It’s the aunty thing: Traditionally, you’d have grandparents, aunties, uncles and extended family members to help raise a child, help give you guidance. Some of these families have only us to support them and so we become like aunties. We’re moms ourselves and we want to empower them as parents. Paty worked with a mother who was short-tempered with her children. She had been in the foster system with very little contact with her own parents, so she had never had an example of attentive parenting to follow. When Paty goes to the house, she gives the child five to ten minutes of conversation time to get things off his chest. Now she’s noticed that his mother has started doing that, too. She lets her son have his chatterbox moments and she invites him to help her with activities. Part of the reason our program works is that we’re community members—not social workers. The term social worker reminds people of the times when Native children were taken from their homes by government workers and placed in Mission schools. Native parents feel that social workers judge us, or they’re looking to see if the house is clean, and they might take our kids. It is a fear we peer specialists understand, as Native children in California and all over the country are still routinely placed with non-native foster parents. When we work with families in Oakland, we’re pushing them to change in small ways, but we’ve also had to push ourselves to re-imagine how we work with people. Here’s an example: A mainstream social services agency might just give a handout on budgeting to a family and leave it at that. Cara took one family to shop for groceries while at the same time providing savings strategies and empowering the mother to look at healthy options while in the grocery store. Even the children were engaged in exploring healthy foods—touching, smelling, and tasting fresh fruit and vegetables. For an isolated, single mother with two young children in a big city, it can make a big difference to have a supportive person with you at the grocery store. There is no substitute for family, but our team is doing its best to re-create a traditional community with a nine-to-five work week. Some of the parents we work with have never known a healthy, consistent relationship. We meet when we say we will meet; we let them know if we are running late; we show up every week when they ask; we listen to them without judgment; we believe in them when they have trouble believing in themselves. The work is slow, but it is powerful. When parents feel held with tenderness and accountability, they are better able to hold and nourish their child, and we believe the result will be a stronger community. 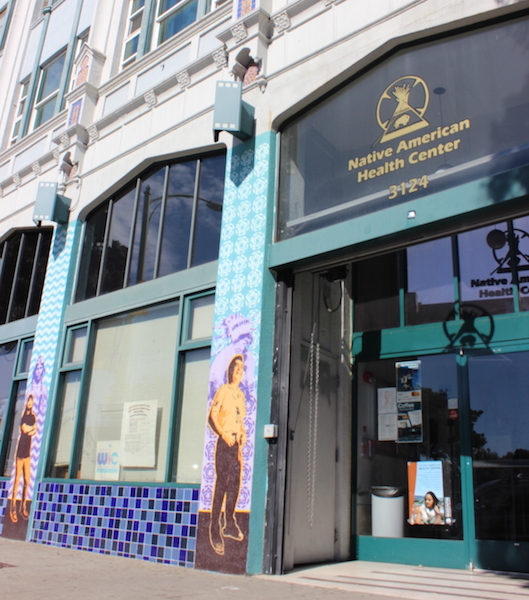 Cara Little and Paty Gonzalez are peer specialists at the Native American Health Center in Oakland, California. The Strong Families Home Visiting Project is funded by the Affordable Care Act of 2010 through the Administration for Children and Families (ACF). This information does not necessarily represent the official position or policies of the ACF. Little and Gonzalez wrote this for Reimagining California, a partnership of the California Endowment and Zócalo Public Square. *Photos courtesy Native American Health Center.